Ben Barker top scored for Panthers against Somerset. Peterborough Panthers crumbled to their heaviest home defeat since returning to Premier League speedway last night (September 5). The city racers were spanked 53-39 by a Somerset side who will finish the regular season as runners-up and receive direct entry into the play-off semi-finals. Panthers went into battle with hopes of snatching second spot themselves, but they were soon scuppered as the visitors were every bit as dominant as the scoreline suggests. Two race advantages and five heat winners are statistics more commonly associated with away teams, but last night they belonged to Panthers who also conceded five 5-1s on their own shale. Only two riders – recent signing Ben Barker and debutant Anders Thomsen – were able to emerge with their heads held high from a sixth – and biggest – home reverse of 2015. 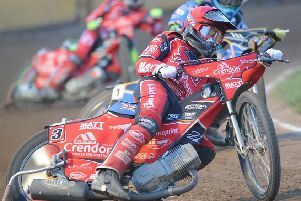 It was also a third loss in a row after they crashed on the road at Ipswich and Somerset recently and joint team boss Carl Johnson pulled no punches in his assessment. Johnson said: “We’ve lost at home far too many times this year and to do so in the manner we did last night is simply not good enough. “We were deservedly beaten by a far better team. Somerset love coming to the Showground and that shows in their results here, but we have to take a long, hard look at our own performance. “To end up with only five race winners and two advantages at our home track is unacceptable – regardless of how good the opposition might be. “We apologise to the supporters for what we produced and we have spoken at length to the riders about our failings in recent meetings. “We haven’t gated well enough and we haven’t won anywhere near enough races. The boys are well aware of the need to put it right and how that needs to happen. Now it is over to them to do it on track. The performance of new arrival Thomsen did at least provide a ray of sunshine for Panthers. The European Under 21 champion powered to two victories in a nine-point haul which represented an encouraging debut. Thomsen’s contribution was bettered (in terms of points) only by that of Barker although the Cornishman did require a tactical ride to reach double figures. Barker had to settle for second place behind Somerset number one Brady Kurtz – a rider so often a useful guest for Panthers – when donning the black and white helmet colours in heat 11 although it did trigger a run of shared outcomes. There were four in succession with Thomsen (heat 12) and Michael Palm Toft (heat 14) taking the chequered flag along the way. Thomsen then battled past Richie Worrall and into third place as Panthers signed off on a high courtesy of a Barker-inspired victory, but the damage had long since been done. Johnson added: “You only have to look at Anders’ results on the continent to see he is a top rider. “He is coming in at a tough stage in the season and is riding equipment which is all new to him. The remaining members of the Panthers team will need to perform considerably better if this season is to end in anything other than an early play-off exit. Simon Lambert’s rise into the main body of the team featured nothing better than third places while Emil Grondal’s move in the opposite direction was littered with lasts. Captain Ulrich Ostergaard and Palm Toft were both short of their best while Rafal Konopka did at least score to his average. The next test for Panthers is a trip to Rye House on Monday (September 7) for the final away meeting of the regular season. PANTHERS: Ben Barker 11+1, Anders Thomsen 9, Michael Palm Toft 5+1, Ulrich Ostergaard 5, Emil Grondal 3+2, Simon Lambert 3+1, Rafal Konopka 3. SOMERSET: Charles Wright 12+1, Paul Starke 11+3, Brady Kurtz 10+1, Rasmus Jensen 7+2, Richie Worrall 7+1, Josh Grajczonek 6, Luke Chessell (guest) 0.